During my childhood, my father was fond of reminding me, “we’re going for a hike, not a fashion show.” As a (more or less) grown-up raft guide, I think I’ve come to understand his impatience with my pre-adventure sartorial indecision. 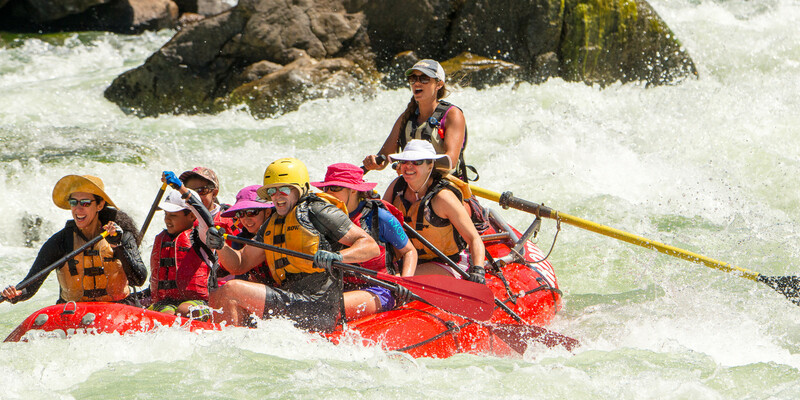 That said, river trips offer the unique opportunity to wear technical, environmentally-appropriate clothing while on water, and to change into whatever you want when the day‘s boating is over. In order to better guide your packing choices, I offer the following list of hard-learned lessons. You’ve heard it before and you’re seeing it here. Technical fabrics work great for the river, and while polypro, polyester, capeline and lycra all have their place, nothing beats the feeling of a nice linen shirt after a day of moist synthetic fibers soaking up your skins excretions. It’s worth noting that natural fibers do a much better job of shedding what we in the industry refer to as “the river stink”. Smelly, moisture-wicking shirts can develop an exponentially increasing degree of olfactory unpleasantness the longer you spend on shore, off the raft. Merino or tropic weight wool works great for all weather conditions while cotton is a great choice for clear skies. Trust me, your family photos will benefit if you bring something nice (and non-smelly) to change into once you make camp for the night. Arrive in camp. Put pants on. It’s the simple, surefire way to look good, give your legs a break from the elements and avoid sunburned calves. Guides do it. Sharp dressed guests do it. On all but the hottest nights, the river corridor is going to cool when the sun goes down. Having fabric between your knees and ankles will help with thermoregulation, fashion augmentation, and mid calf protection. Your razor and comb? Forget about them. You want these memories to still be rugged. The photos that come back from these trips should showcase a slightly disheveled, yet ultimately put together individual enjoying all that America’s rivers have to offer. The best way to capture that fashionably messy outdoor look is to actually just be in the outdoors and let nature do its thing. Come back from your odyssey with a few days worth of beard and a touch of natural suntan. Fashion “experts” like to tell men to avoid sandals. Ignore that, it’s ridiculous. It’s only rarely on a river trip that you will see me in something other than Chacos. Function still takes precedence on the river and I can’t find a good reason to put something else on my feet. Besides, everyone else is going to be wearing some variation of a water specific shoe and it’s important to look like you’re part of the trip. The way to stand out is look good, not weird. Seriously. The most important part of your trip is to have fun! Looking good is just a bonus. About the Author: I used to follow men’s fashion and read about it on the internet, then I became a river guide, broke my computer, and decided I couldn’t afford a new one. I was also, once, told that I looked nice after a day of rafting.